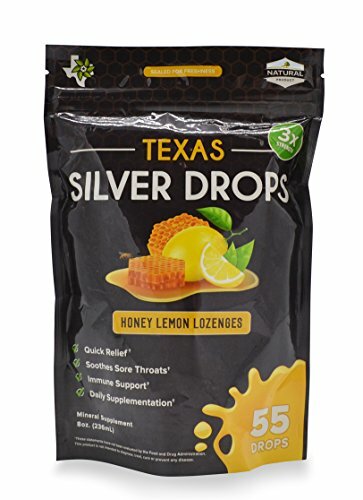 Texas Silver Drops are all-natural lozenges that support throat and mouth health. Silver is an incredibly effective immune support supplement. A major key in silver's ability to support oral/throat health is keeping the silver in contact with the mouth and throat for 6 minutes. It can be very difficult to gargle or hold silver solution in your mouth for six minutes That's where Texas Silver Drops come in. The sweet taste of soothing honey with lemon will help your throat feel smooth all while the silver goes to work at the root cause of the problem. Texas Silver Drops, when not chewed, stays in direct contact with your mouth and throat for 6-10 minutes creating the optimal opportunity to maximize the silver's potential. All natural Texas Silver Drops lozenges. Perfect for Throat & Mouth Health, Dry Mouth and more! Contain a full tsp of therapeutic 30ppm silver in each drop. Help boost your Immune System with daily use. Taking Silver in drop form creates the optimal opportunity to maximize the silver's potential. If you have any questions about this product by Texas Superfood Family of Products, contact us by completing and submitting the form below. If you are looking for a specif part number, please include it with your message.